Only need 1 shirt? No problem, email your request for pricing on smaller quantities. Order blank stock too at ridiculous low prices.. email for pricing. Value! Printed T-Shirts for Less. 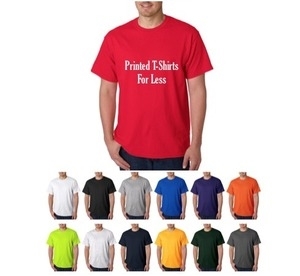 Value Princed Adult T-Shirts for orders 144 pieces or more. Includes one-sided/ one-color imprint. Add .99 for second side print/ add. 35 for second color. Contact customer service for multi color and large quantity discount quotes. This heavy weight t-shirt that is made from 100% cotton and comes in a huge variety of colors and sizes. Holds up well and will barely shrink.